Sorry I haven't blogged since Tuesday. I attended that iMovie class and I've been playing around with making videos. I finished one for Close To My Heart's Extravaganza instructor submission but I don't want to post it here just yet. But I will soon! 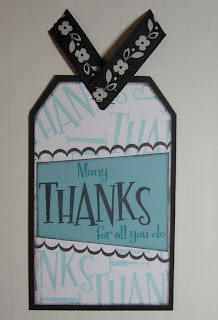 Meanwhile, it's the beginning of a new month and that means the Stamp of the Month Blog Hop. Many, many consultants are participating, so make sure you hop along to see all sorts of great artwork using "A Little of Everything" stamp of the month for March. This stamp set is going to be a big hit because of its versatility. 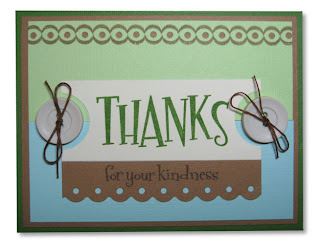 It pretty much covers every occasion which will be perfect for you card makers out there. 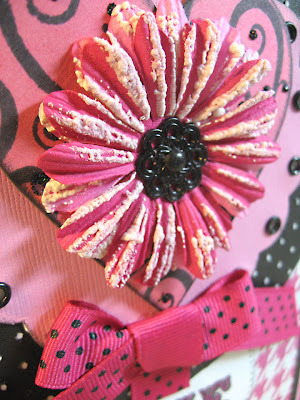 My sample above uses the Caboodle papers and Colonial White ric-rac ribbon. I snuck in that Martha Stewart bunny punch just 'cause he's so cute. Here are a few more quick samples of mine. Be sure to keep hopping to see lots more. If you are already following the hop, you came from Angela's blog. Now keep it up and hop over to Haley's! 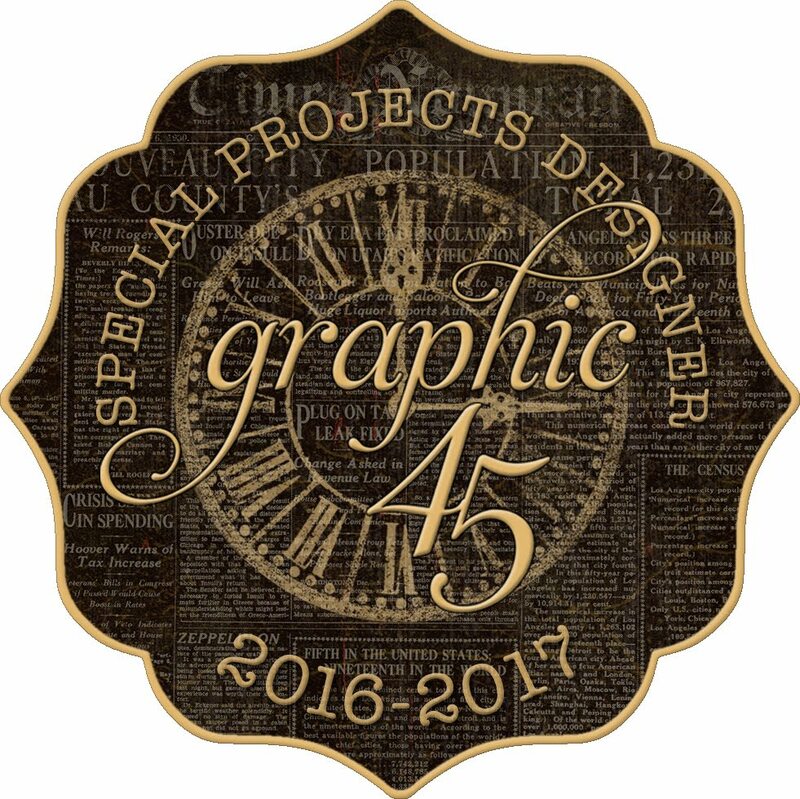 I am seeing more and more card designs in the magazines lately utilizing buttons. There are buttons everywhere in the latest issue of Paper Crafts. And all the ideas are so darn cute and simple, it really inspired me to try some myself. 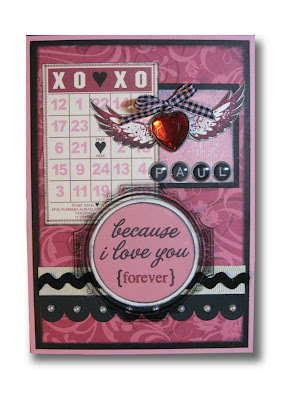 All the Close To My Heart cardstock used in my designs (with a few minor exceptions) are from the textured cardstock combos that are currently Buy One Get One FREE this month. The buttons are from CTMH as well, and so are the stamps of course, which I have listed below each photo. I utilized a few of my newest punches to keep things simple and quick. And you might notice that I didn't ink a single edge of anything in these cards. Unbelievable, right? It was hard to resist that ink-distressing since it's my favorite touch to add to everything I create with paper, but I have noticed a trend lately where inking edges is absent and clean smooth lines are popular. 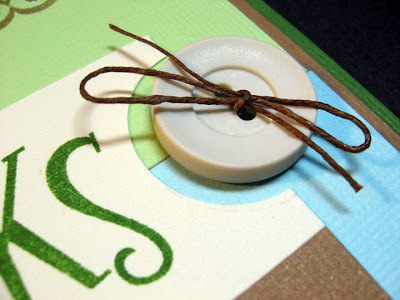 I hope these ideas also inspire you to try using buttons on your cards. I wish I had more time to explain each one, but I am running out the door to attend an iMovie/iDVD class at my local Apple dealer (Visual Dynamics). I am excited to learn how to create videos! As always, you can click on each photo to get a larger view to see more details. Have a great day! More textured cardstock! I love this stuff, and can't seem to get enough. This week's Mojo Monday sketch inspired this Easter card for me today. 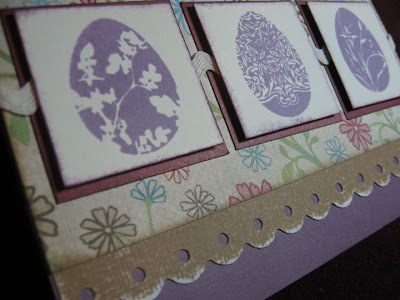 I wanted to use Close To My Heart's Spring Harmony textured cardstock combos (X5681) along with this "Springtime" stamp set (D1415). I included Heavenly Blue ribbons (Z1124) and some adhesive pearls. For a finishing touch, I added some Liquid Glass (Z679) for the polka dots on the umbrella and boots. Liquid Glass, incidentally, is one of the most versatile products I know. Not only does it work great as a strong adhesive for ribbon, chipboard, and metal, it also serves as a clear gloss over the top of stamped images, and gives a glaze-like effect over pattern paper. You can even apply a thin layer of it to an old photo, let it dry, then bend and crack it giving a very cool aged-glass effect. 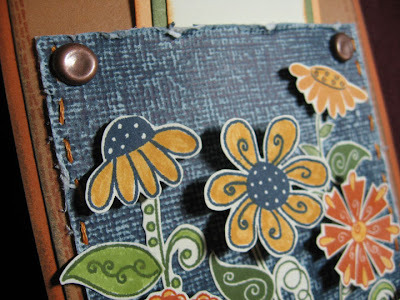 I have always been a big fan of textured cardstock. It just adds that extra touch and, well, texture. Bazzill used to be the only textured cardstock brand around my town before the scrapbook stores closed and believe me, I stocked up every chance I could. 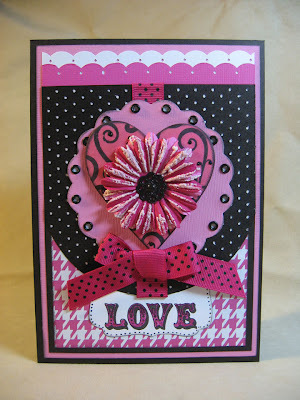 Thankfully Close To My Heart carries textured cardstock and like all of their cardstock, it has a white core. 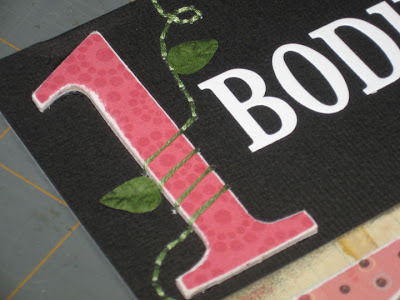 This is a huge plus when creating with textured cardstock! You'll see what I mean in the examples below. 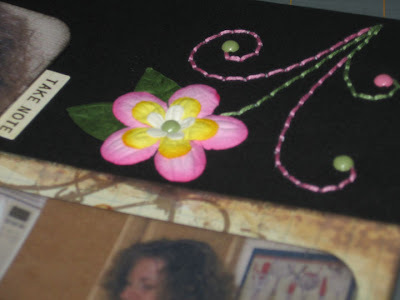 But first I had to share with you the super benefit of purchasing textured cardstock from CTMH this month. All through February, when you purchase a textured cardstock combo, you'll not only get an additional pack for FREE, but CTMH will donate $2 for each combo purchase to Operation Smile's Hearts for Haiti relief campaign. You can read all about Operation Smile's efforts at the link to the right. And if you'd like to take advantage of this offer, just click on my shopping link to the right when you're ready. You can view our Idea Books online quickly and easily. 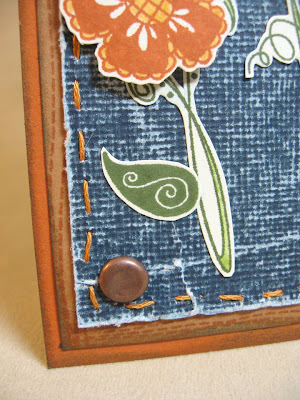 Outdoor Denim cardstock sanded and distressed on the edges adds a blue jeans effect. 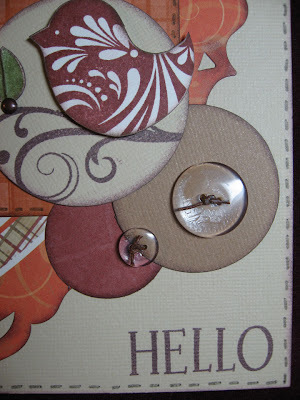 The card base is Bamboo textured cardstock along with the top circle. The lower circle is Desert Sand textured. 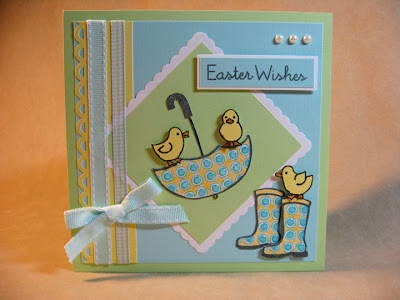 It takes stamping nicely and gives a special feel to a card. 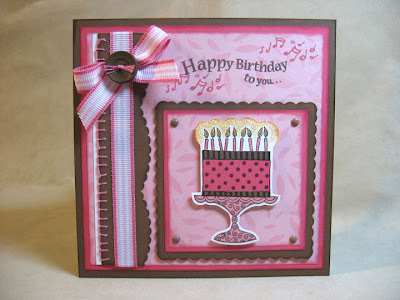 Bamboo and Desert Sand cardstock again in this card. I sponge daubed some ink across the textured pattern for a distressed look. This Desert Sand again. 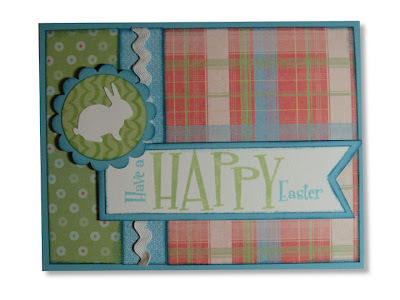 Punched borders are all the rage on every card I see these days. 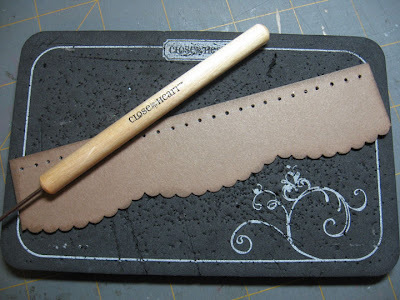 Why not use textured cardstock and sand it a little to make it really unique? 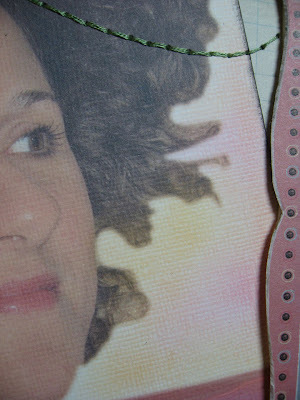 Here I used White Daisy textured cardstock and actually printed my photo directly on it. It gives it a canvas look, doesn't it? I went back in with chalks for a background treatment. 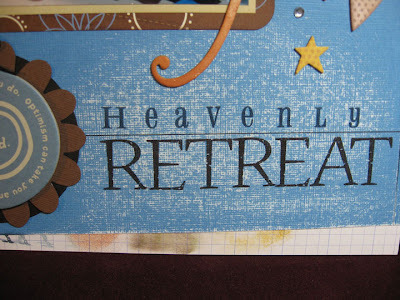 Before stamping my scrapbook title onto this page, I sanded the surface where the title would go first, to give more emphasis. 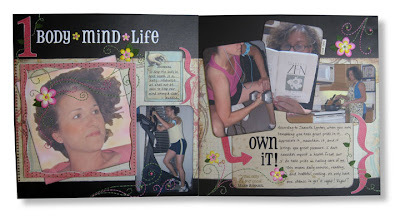 There are several different colors of textured cardstock in this scrapbook page. 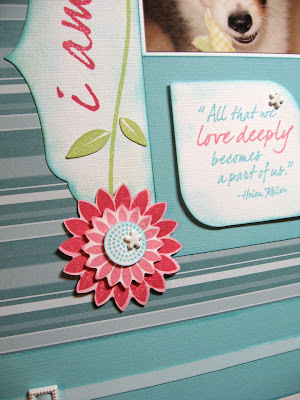 By inking edges, the textured pattern really pops for a dramatic effect. 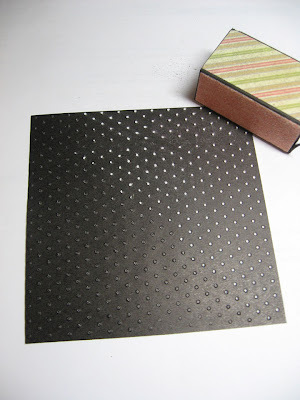 If you still aren't convinced that Textured is Tops, I suggest comparing a card made with regular cardstock next to the same card made with textured cardstock. Then get back to me. A little more action on this week's Mojo Monday sketch with some tilts and layers. 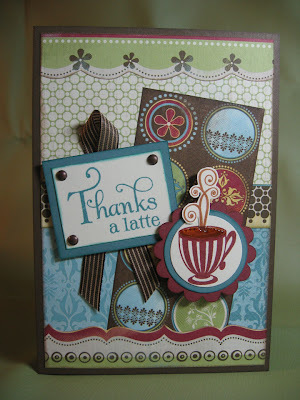 Since I recently purchased this Delightful & Delicious coffee stamp set from Verve Stamps and am a coffee lover, I thought it was most certainly the right time for yet another coffee-themed card. 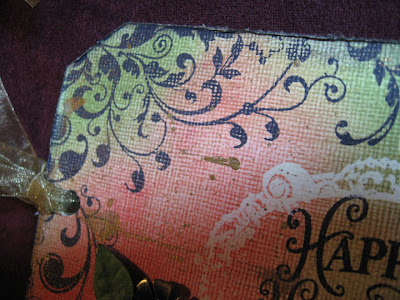 The papers are from Close To My Heart's Emporium paper pack, and rather than use a border punch on the top and bottom of the card, I simply cut borders from the paper itself. It's one of my favorite CTMH paper lines! Antique copper brads frame the title and Liquid Glass serves well as real-looking coffee in the cup. 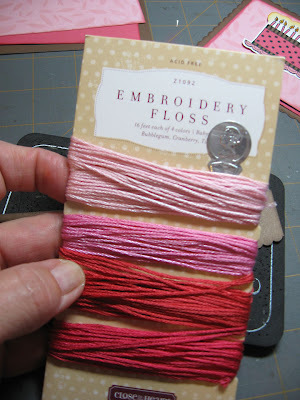 Have you ever wondered what the heck to do with embroidery floss? 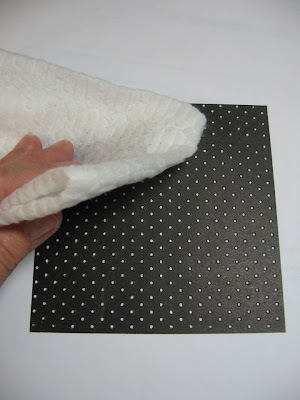 Obviously, there's the traditional cross stitch, but in the papercrafting world, the possibilities are endless. In fact, that's how I felt today as I made the first project below. I kept thinking and dreaming up different ways to use it, and if time was limitless I would have certainly done a whole slew of things. For now, though, these are a few ideas. 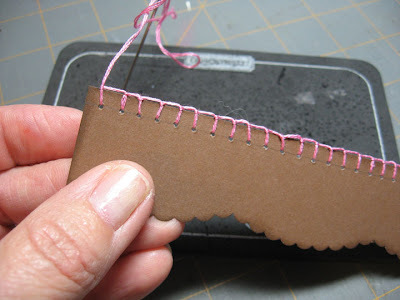 This tag/card incorporates a lot of techniques (sanding, edge distressing, & LOTS of cutting), plus a simple straight stitch with a very homey feel. No straight lines, just quick stitching by hand to add to the blue jean effect achieved with Outdoor Denim textured cardstock and a sanding block. Here's a little closer look, and you'll also notice that I hammered those Big Brads a little. This is the desired effect. I'll show you how it's done, but I wanted you to first see it up close. It's not perfect, but it's cute! I pull the thread almost all the way tight, but stop a little early so I have this little loop. Now this is the important part: you need to come through the loop with the needle from the back side just like this photo. 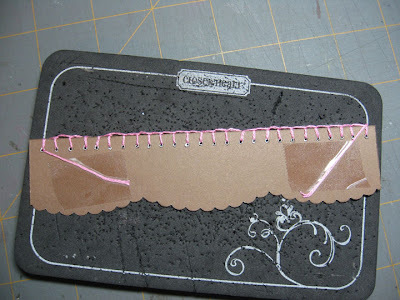 If you don't, you won't have the blanket stitch effect. 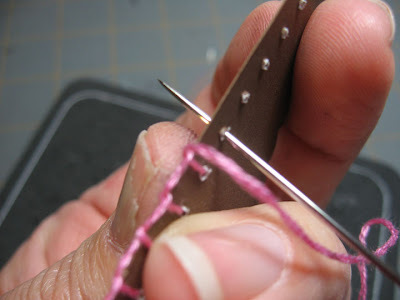 Once I've pulled the needle through that loop, I gently pull and tighten the stitch down, making sure that I have the desired effect. This is how it should look. Like I said, it's not perfect, but when you add it to the card, it's really cute! 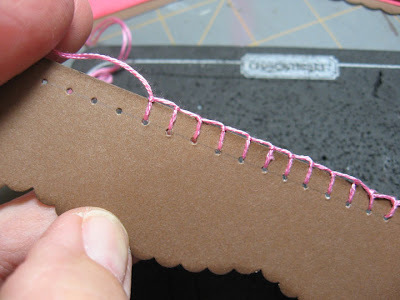 I'm not sure, but I think this straight connected stitch is called a back stitch(?) Anyway, you achieve this by stitching one stitch ahead of where you are going, then stitching back one stitch to connect them. 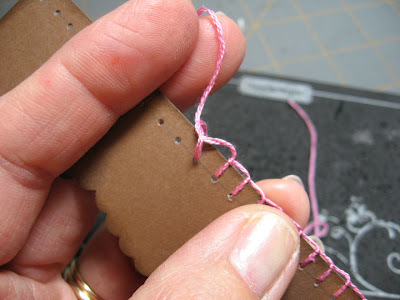 I start this stitch by coming up through the back of the page with my needle. 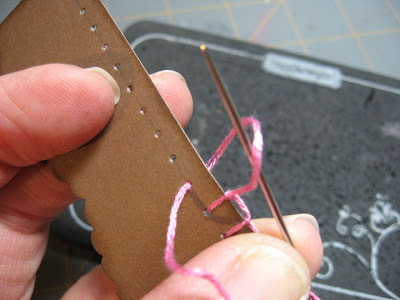 I drew a light pencil line of the path I wanted the stitch to follow, then I just hopped the stitches over the chipboard number. (Fun, eh?) 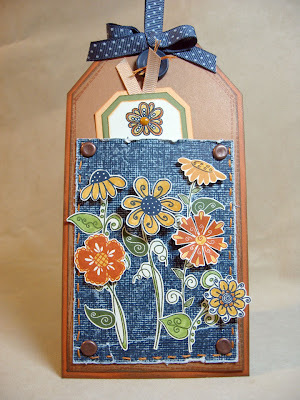 I added those little leaves from CTMH's "Just Blooms" Summer Posies. Here's some more of those Posies. I added the brads for a clean finish to the stitching. I hope you give embroidery floss a try. It may be a little time-consuming, but I think worth the effort! 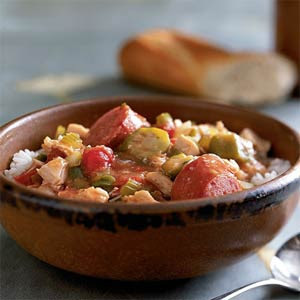 Sausage and Chicken Gumbo is one of the meals we're having this week. It's a little chilly here in Florida this week, so a good-old stew like this is great. It's quick, easy, healthy and delicious. All four of my favorite features of a recipe. It has turkey kielbasa and chicken, plus okra and other veggies. I serve it on white rice. (I know brown is better for ya, but I just love our sticky Japanese rice.) If you'd like the recipe, it's from Cooking Light at this link. I feel it beginning. Well, I've sort of been feeling it for a little while now. My daughter is entering the years I have been dreading. But NOW it's different because while I thought we might be in those years already (she's only 12 and it's just a wee bit earlier than I had planned) I was seriously disillusioned. That was only a small taste. Funny how that works. Mothers don't get hit all of a sudden with the teenage attitude thing. It's gradual, to a point, but then it suddenly DOES jump right up and smack you in the face out of nowhere. This is now my life and I'm already ready for it to be over and to have my little girl back again. Time to hunker down for a handful of years, I guess, and brave through it. When it's so plain to see that this is what's she's going through, and as a woman I know what it's like to have your hormones go haywire, why is it not equally as plain to see how to handle it? If only I could float out of my body and hover over the situation at hand and deal with it as a spectator might. Simple to say, but I'm NOT a spectator, I'm a mother. Try as I might, it's profoundly difficult to remove all emotion and feeling from it. There must be a zillion books out there on the topic of parenting a pre-teen/teenager. And I'm sure the day will come soon enough where I, too, am stocking up. But for now I shall wallow. And share it with you. On the other side of the coin, I welcome this challenge because it ironically has unearthed a whole new sense of humor in me (that helps me cope) while it has also broadened my horizons on various types of wines (that help me cope). When she starts to get really fired up and I feel myself starting to lose my cool, I dodge the button-pushing with the most ludicrous and maniacal thoughts I can manage at the precise moment of her antics. Example: After 4 hours of dress shopping last night for the Father/Daughter Dance (which is going on right now) and today curling her hair (48 curls on the curling iron to be exact), doing her nails, making her and Dad a nice meal, ironing her dress pleats perfectly, making up a snack to bring for the refreshment table, and finally sitting down to stitch the straps on the aforementioned dress for a custom fit. . . take a breath . . . she stands before me and throws a classic hissy fit for being asked to kindly wash her food containers that have been fermenting in several different lunch boxes and bags all week. Rather than blow my stack, which I feel like strongly doing, I switch gears. I smile a slow and devious smile mostly to myself for my own delicious pleasure because at that precise moment I am imagining my own scene in a Willy Wonka movie where the needle and thread I am currently using fly out of my hand unassisted and proceed to sew the lips of my darling daughter shut tight. Her eyes have grown as big as saucers as the magical needle does its job. And I am perched happily on my stool watching the whole thing with glee, while clapping my hands and bouncing a bit at the sight of it all. Until it's time to take photos before they go out the door to the dance. She is brooding, impatient, and giving me the "you are so totally lame, Mom" look. I am hurt inside because I want this to be a special night for her. One to recollect when looking back in the scrapbook. Her last year in elementary school. Her last Father/Daughter dance. Dad backs me up with the photo session thankfully and the mission is accomplished. Perhaps the fact that I got my way with the picture-taking has unsettled her, because shortly thereafter she is at the door ready to walk out and when I go in for a kiss to wish her a wonderful evening, I get the pull-back and "Ugh, you smell like cheese, Mom!" But instead I walk away and think of the "Stinky Cheese Man", one of the most hilarious children's books I remember reading to her when she was little. I laughed through the whole thing and because Mommy was laughing, she was laughing. And now, all that's drumming through my head is: "Run, run, run as fast as you can, you can't catch me I'm the Stinky Cheese Mom." I know I will never have my little one back. 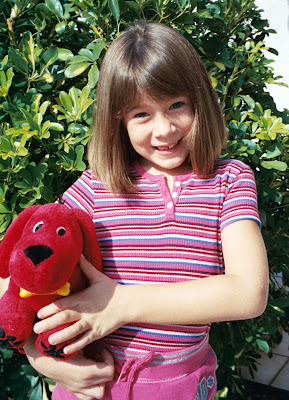 My toothless cutie who loved Clifford and thought that crayons were the greatest things ever. But I know that she will come back to me in a beautiful, wonderful way much like a butterfly. So I will tuck her into her cocoon for now and wait for that glorious day... with the help of humor and wine. Are Videos Part of My Journey? If you enjoy the comic strip ZITS as much as I do, you'll like this one. Did you see it a few days ago? Not a lot of time today for creativity unfortunately. I did manage to go to Michaels and get some cute things for a Valentine card for my daughter, so I'll post that soon. Meanwhile, I've been cruising around the web in between appointments and stuff, and find myself getting so totally overwhelmed with the amount of information regarding papercrafting. I know you can relate. One can spend hours upon hours looking at products, ideas, innovations, trends, and watching YouTube videos. Which has me thinking... perhaps that's something I should try next. I think I would love to create videos to share with you! 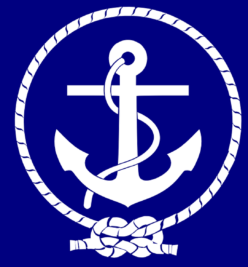 Could this be another part of my creative journey? I think so. So I'll spend some time thinking that over and researching the materials I'll need, then get back to you. Meanwhile, if you want to share your thoughts on this, please do! 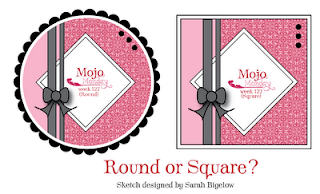 I realize that Mojo Monday bloggers don't necessarily have to post their creations from the sketches on Mondays, but for some reason I feel compelled to shoot for that. Alas, this week I did not, but for good reason. 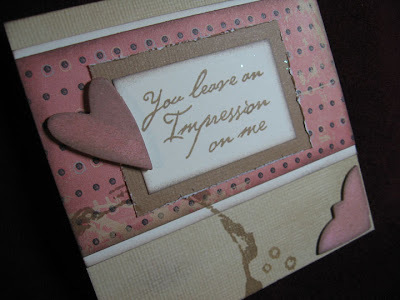 The Close To My Heart stamp of the month blog hop was yesterday and it was my first time! 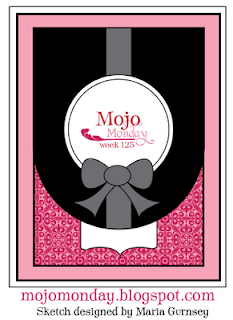 Here's this week's Mojo Monday sketch #124 along with my creation. You would think this is a Valentine for my hubby, but I think I'll hold on to it until our 18th anniversary in May. I dug into my non-CTMH stash this week almost entirely, except for the stamps. The wings are from D1403 Star Power, and the words are from C1259 Because I Love You. 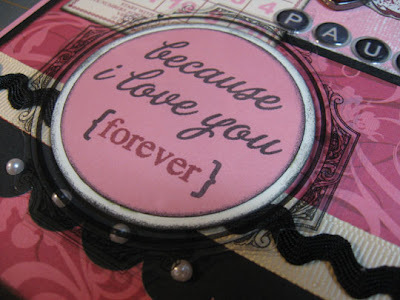 The word "forever" is from the now-retired "F" alphabet solo set. The little brackets are from D1222 Tiny Typewriter Alphabet. 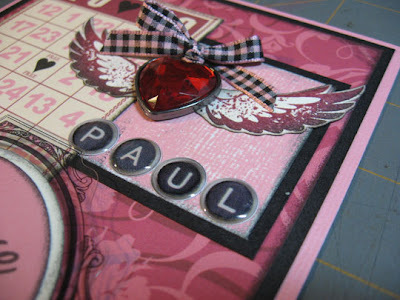 The cute little epoxy typewriter letters (PAUL) are from K&Company. The heart pendant is from Blue Moon Beads' (Madame Delphine's) metal charms set. The papers and the transparency are from Creative Imaginations that I've been hoarding for a while. The mini bingo card is my favorite, from Jenny Bowlin Studios. The ribbons are random ones from my stash and the adhesive pearls are from CTMH's past Connections Club rewards that I had leftover. Here's a few close-ups so you can see the details. And, as always, you can click on the main photo to see a nice big view.